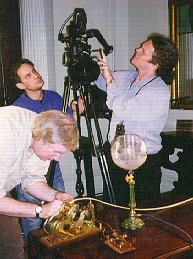 This is a special report on the filming of some of my museum's telegraph equipment for two Public Television specials to be aired in 1999 and 2000. I am occasionally contacted by television and film directors and other museums to arrange for the use of the items in my museum's collection as props and for special museum displays and exhibitions. Whenever possible I make every attempt to accommodate these requests. This request came from a production company that films specials for PBS, the Discovery Channel, the History Channel, and others. They needed authentic Civil War era apparatus for scenes of President Lincoln in the War Office for a special to be aired in the year 2000. For these scenes, I chose to use a lovely and very early camelback key and a Charles Chester weight-driven register. They also needed apparatus from the year 1900 to show the sending and receipt of emergency messages from the Gulf Coast about an approaching storm and catastrophic flooding. For these scenes, I chose an interesting Bunnell KOB. I made arrangements to meet the film company on location in New York City and to bring all of the apparatus with me. They had made arrangements with the "Merchant's House Museum", the earliest remaining building in the city to have all of its (1830's) interior and furnishings intact. 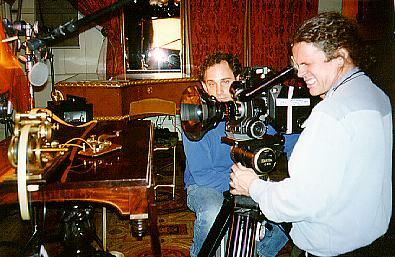 The filming was done in a wonderful old room and among furniture that conjured up thoughts of bygone times. They had also arranged to have a collector of early gas lamps bring some of the most impressive lamps from his collection to provide background and lighting for the telegraph apparatus. He had even brought along portable gas tanks so he could "fire up" the early lamps. Three hours were spent just setting up and positioning the apparatus and positioning the special barn door shutter-equipped lights and huge reflectors and filters that were used to produce just the right lighting and shadow effects. A wonderful New York Delicatessen-style table of food and soft drinks was available throughout the shoot so time time passed rapidly. I was amazed to see that they were doing the shoot with a film camera rather than a video camera. I had assumed that all professional video productions were filmed in video but they told me that it was impossible to come close to the detail and "feeling" of film even with today's newest video cameras. They used a tiny television camera that took pictures right through the lens of the movie camera and displayed them on a large video monitor as an aid in planning each shot and setup. This provided a look at how the scene was to appear on a video screen in real-time as the film was being exposed. This concern with absolute perfection and authenticity characterized the entire production. Every detail became a critical issue. For the Civil War scenes, the paper tape passing through the register had to show the dot and dash marks clearly enough to be seen on camera, and initially, the directors wanted to use an ink-pen to make the marks. I told them that the register did not use ink but made raised impressions in the paper with a pointed stylus. To preserve authenticity, they agreed to try to film the raised impressions even though it would be difficult. To be safe, they asked me to manufacture a threaded ink pen to replace the stylus just in case the impressions did not show up well on film. Luckily, my threaded pen was not necessary. the sound man attaching a microphone to the Charles Chester register using "silly putty". (29KB) You can see the camera being adjusted for a long shot in the background and a gas lamp in the foreground. the positioning of the camera for a close-up view of the register.(36KB). Close-up views of the mechanism and movements of the register were enhanced by panning the camera along the entire mechanism. The through-the-lens video screen display can be seen behind the table. 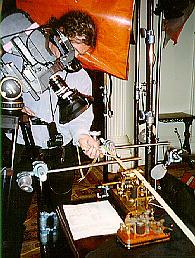 the filming of the raised dots and dashes on the paper tape. (22KB) The lighting and camera angle had to be very carefully chosen to allow a clear view of the raised impressions left by the register's stylus on the paper tape. The moving tape shot will be superimposed over a map of the appropriate Civil War battlefield and merged with the clicking sound effects to produce a dynamic sense of urgency. 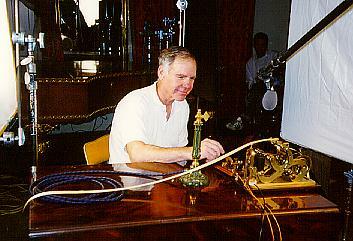 Tom Perera sending Morse code with one of the gas lamps in the foreground during the setup for the scene.(26KB). 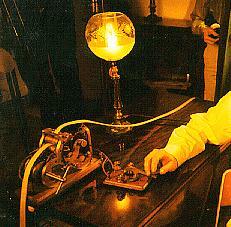 Notice the suspended microphone designed to pick up the airbourne sounds from the apparatus. These sounds are to be mixed with the frame-mounted microphone sounds to produce the final sound effects. the actual gas-lighted scene. (19KB) with a member of the film crew doing the sending. My hands were too old and scarred to be acceptable for many of the scenes so I had to train a young man to send the code. I wrote out the message in large dots and dashes and he simply read down the page. I really enjoyed the experience of being part of this filming. Although it took well over 9 hours of work and many hundreds of feet of film to capture sequences that will last a total of only about 45 seconds, it was an amazing experience to see the amount of attention to detail that goes into a professional film shoot. Subtle differences in lighting that I could not even see were produced by meticulous placement of the lights, reflectors, filters, and camera. Day became night at the switch of a huge filter in front of a reflector and the change of an aperture on the camera. I find myself looking with new interest and insight at the television productions of historic events, and trying to figure out what kind of lighting and sound setup was used for each one. I will try to post a schedule of when the sequences will be aired as soon as I have this information.